What could be better than a day spent at the cricket? Yet as the play drifts on into the evening it can get a little chilly, so wrap yourself in this lightweight shawl. Personalise it with your team’s colours and keep snuggled up if rain stops play. Fully written, line-by-line instructions, with simple stripes of colour make this heart-shaped cabled shawl a six for sure. The knitted-on lace edging adds a feminine and whimsical touch. 2 pdf files are provided – a printer friendly version and one with all of the high-res images. For more images, click on the photo above. 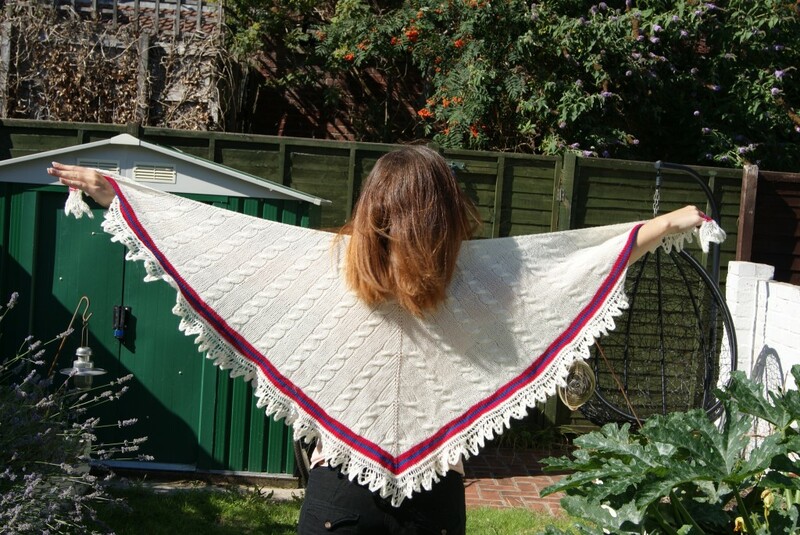 This entry was posted in Patterns and tagged designs, patterns, shawl on 19 August, 2013 by fakoriginal.